Indonesian Caves Hold Oldest Figurative Painting Ever Found, Scientists Say Archaeologists found thousands of drawings and stencils in a warren of limestone caves in remote mountains on the island of Borneo. But no one knew how old they were until now. The oldest figurative painting, found in caves at the far eastern edge of the island of Borneo, depicts a wild cow with horns and dates to at least 40,000 years ago — thousands of years older than figurative paintings found in Europe. Archaeologists exploring caves in Indonesia have discovered a wall painting that could be the oldest figurative painting ever found. It depicts ... a cow. Despite the humble subject matter, the painting is extraordinary because it's at least 40,000 years old. That makes it thousands of years older than the oldest such paintings in Europe. 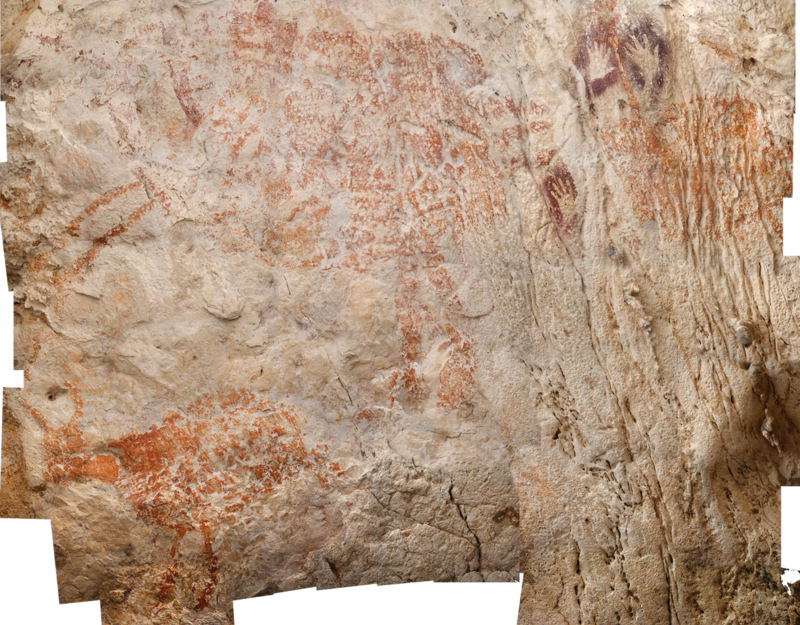 The Indonesia painting is one of thousands of drawings and stencils in a warren of limestone caves tucked into remote mountains at the far eastern edge of the island of Borneo, a part of Indonesia called Kalimantan. Archaeologists went there in the 1990s looking for cave art. Archaeologist Maxime Aubert of Griffith University in Australia says that when they showed photos of cave art to the local people, "They said, 'Oh, yeah, we've seen something like that in the caves.' 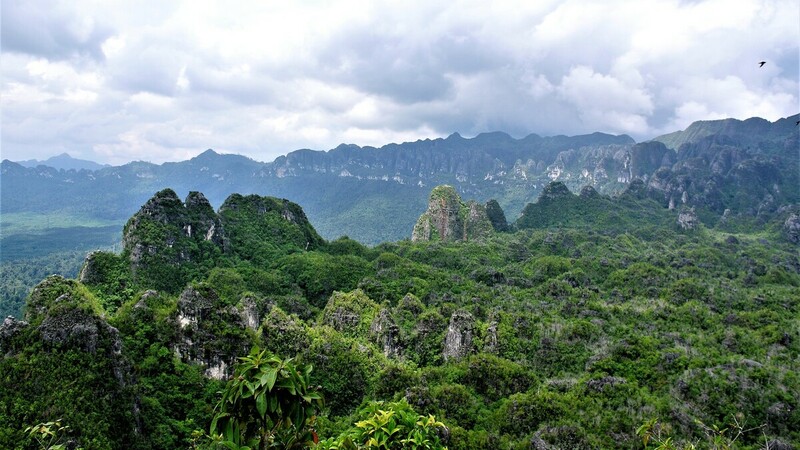 " The locals knew the caves from going there to harvest birds' nests for the Asian market in birds' nest soup. The drawings and paintings included lots of hand stencils made by putting a hand up against a rock and blowing liquid ochre onto it — as well as paintings of animals and of stick-figure humans with headdresses and spears. But no one knew how old they were. Archaeologists found hand stencils made by blowing liquid ochre over hands placed on cave rocks. 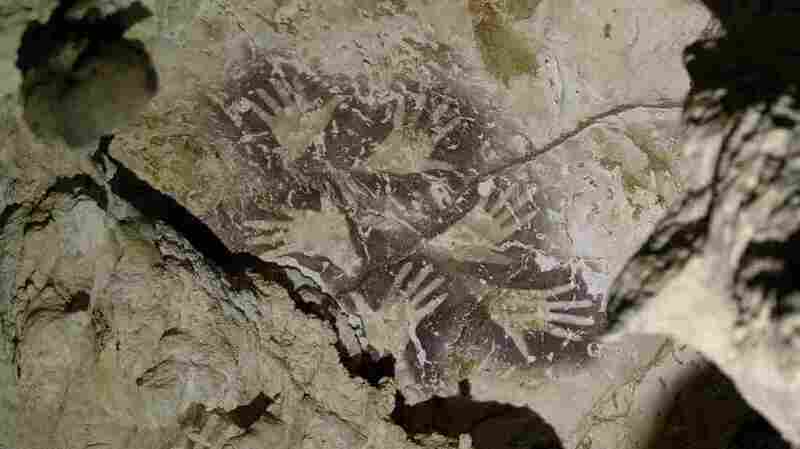 The earliest hand stencils are more than 50,000 years old. Recently, Aubert used a sophisticated form of dating technology that measures the elements uranium and thorium in the rock underlying the paintings, described in this week's issue of the journal Nature. The result, he says, "was amazing." The oldest were anywhere from 40,000 to 52,000 years old. And some were clearly representational art and "not just ... an abstract design," Aubert says. "It's clearly like someone decided to depict what they saw, like an animal or like another human," he says. "And they made that, they did that on purpose." The oldest figurative painting was of a wild cow with horns that dates to at least 40,000 years ago — thousands of years older than similar figurative paintings in Europe. Older "artwork" has been found in Europe and Africa, but they are geometric drawings, consisting of lines and dots and hash marks. And there are carved figurines from Europe and Israel that date back even further. Archaeologists found the cave paintings in limestone caves in remote mountains at the eastern edge of the island of Borneo, a part of Indonesia called Kalimantan. Cave art expert Genevieve von Petzinger of the University of Victoria in Canada says the discovery is exciting but not that surprising. "I feel like we've been waiting for this now," von Petzinger says, adding that she thinks figurative art goes back a lot further than people thought. "My personal opinion is that our ancestors in Africa already knew how to do all this stuff." Von Petzinger says she expects archaeologists will likely find it, if they look in the right places. 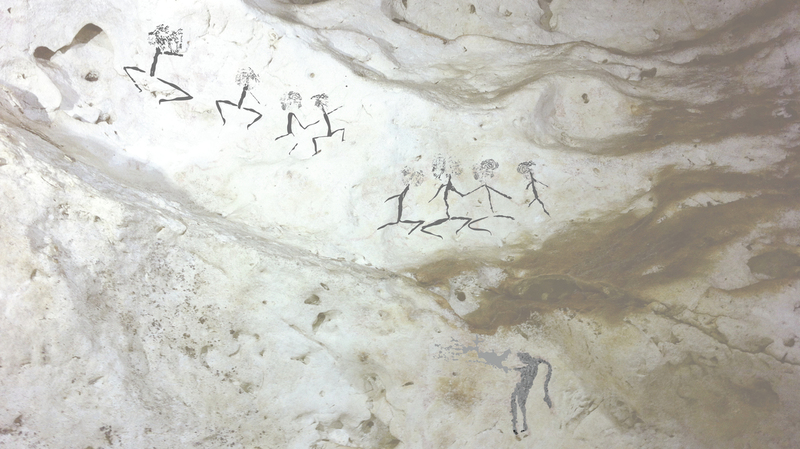 Aubert says the earliest hand stencils in the Borneo caves date back more than 50,000 years. He says that the painters kept returning to the caves and adding new work until about 20,000 years ago — an astonishing 30,000-year span — and that their work got more complicated over time. Paintings of human figures on Borneo could be up to 20,000 years old. Researchers say they found paintings of people wearing headdresses and carrying spears. Cave art paints a picture, literally, of our ancestors' world that old bones or tools cannot, Aubert says. "You can see the things ... they were doing — ritual dances, they were wearing those headdresses, you can see all that," he says. "The rock art kind of talks to you, it kind of feels like, 'yeah, they kind of did that for me, you know.' "
And they did it for their families, apparently. In one cave, the scientists crawled through a narrow opening into a side chamber. Inside, there were more hand stencils ... but different. "You go in and you look and there are hand stencils there, but they're really small," Aubert says. "It's children." Prehistoric kindergarten finger painting, perhaps.